I apologize for not posting this week someone (ahem, K) made me sick. All I have done is sleep. I've got some catching up to do, and I'm going to do it all in one post. First, it's the Phabulous Photo Phriday Phiesta over at Candid Carrie's blog. Here's my phavorite photo for this week. I realize the pic is not that good, but a 9 yr old behind a new camera that not even I am good at at 7 in the morning is not easy. Notice what I have on. That's right! My apron arrived. Yay! Isn't it beautiful?! I love it, and it is perfectly me. I even made chocolate chip pancakes for K this morning in honor of my apron arriving. I would've worn it out to take K to the bus, but she wouldn't let me. The apron is fabulous. It fits me which is extraordinary. I love everything about it, but my favorite part is the ties which are black and yellow. There is just something about the material used for that part. Look at the cute little sticker that adorned the package it arrived in. I'm also using this pic as my before pic for when I lose all that weight I'm going to lose. 6 lbs so far if my scale is accurate. You never can tell about those things. Since we are discussing weight loss, check out this giveaway from Nerdy Loser which I also forgot to tell you about. I'm beginning to wonder about my sanity. Oh, and since I missed it due to sickness, Happy Belated National Hugging Day! I'm sending big ol hugs across the internet to you. It's probably the safest way to get hugs from me right now. Hopefully, next week I will be better and not quite as forgetful. 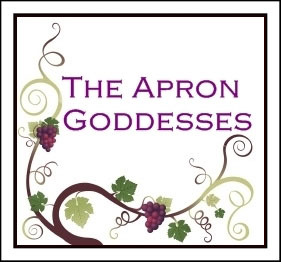 Don't forget if you want to try to win your own apron to check out The Apron Goddesses. There's a new apron giveaway each week. Now I'm off to disinfect my laptop after sneezing on it for the millionth time while typing this post. Ok, now that apron is soooo cute! Love the photo and I think it was a great one for 7:00am!!! Thanks for stopping by! Apron is wonderful! I have two my mother made years and years ago - I wear them all the time. Also wanted you to know I join you in the healthy life and weight loss journey. Five pounds gone forever and we will not give up this quest. OUR lives depend on it! love the apron! soo cute, sorry you're sick though. And congrats on 6 lbs...it is not easy! I've been doing jenny craig since sept and have lost 17....only 13 more to go! I love your apron- great pic, thanks for sharing. Oh I love it! I love poppies. The apron is adorable and looks adorable even though it was taken by an adorable seven year old at 7:00 in the morning!! Sorry to hear you were under the weather, don't jump back into things too quickly or you won't get any better! Hope you feel better, soon! I've had a nasty cold since last week-just feeling back to normal now. The apron & you are beautiful! Sorry you've been sick...bet that apron perked you right up! thanks for visiting and leaving a comment. I absolutely love the apron..the pattern is gorgeous! Oh, your jewelry is awesome. I will come back for a longer visit later. Thanks for visiting me on my big, bloggy day! Sorry you've been sick!!! But I bet the darling apron makes up for everything!!! Hi and thanks for stopping by to welcome me to the Fiesta! I am really going to enjoy it! I love the apron. Very cute - I love to cook and really need a good apron. I keep seeing cute ones and think "I need to grab one" and I never seem to do it. A few more grease spots on my work clothes ought to motivate me! Thanks for the info. I love the apron... I love aprons! They make everything taste better. Ha. Hope you are feeling better... Thanks for stopping by my blog! Watch out you will want more!! Suscribe and be entered to win a pair of Magnolia Earrings! Stay at home mom by day. Jewelry designer/creator by night. No reverse that. Just doing the things I love and leading a pretty boring life. My daughter was born with a soft cleft palate, and that was the fuel to start Jewel Street Designs. It was my way of releasing my creative energy.